The historic skylight in Chicago Union station's Grand Hall. Credit: Amtrak. Amtrak has begun a $22 million project to restore a 92-year-old skylight in Chicago Union station’s Great Hall – the operator’s fourth busiest station. Built in 1925, the 219-foot-long skylight is 115ft above floor level but over the years the barrel-vaulted skylight has deteriorated due to water damage and is no longer fit for purpose. 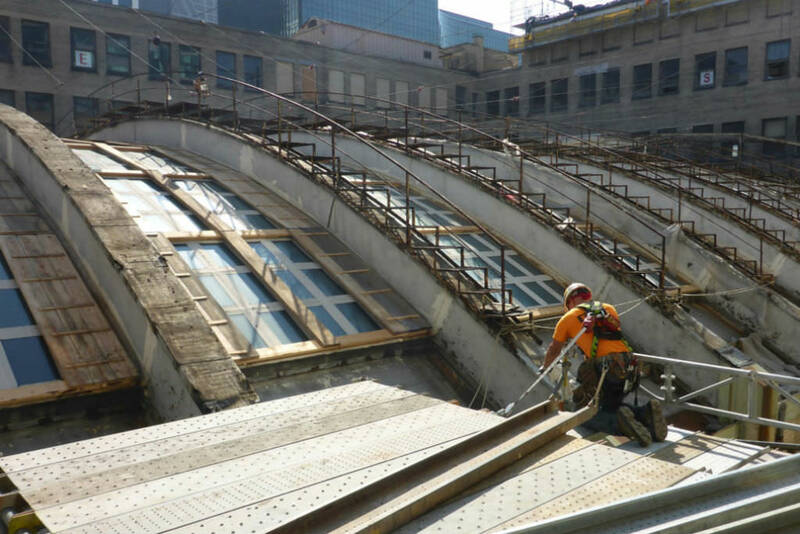 To keep the skylight’s historic appearance, and overcome complications with the drainage system, workers will construct a new, energy-efficient skylight above the existing one. Once it is finished, 50 per cent more natural light is expected to pass into the Great Hall by replacing 2,052 pieces of wire-embedded glass with transparent glass in the existing structure. The new skylight will sit five feat above the historic one and be made up of 858 panes of clear, high-efficiency glass. Restoration work to the skylight will see it painted in historic colours, as well as the walls and ceiling. To minimise disruption during work, the team will use a suspended working deck and swing stages, to allow customers to move more freely below. This suspended deck will mean customers will notice less light in the Great Hall during work. Designed by architect Goettsch Partners, the work is being undertaken by Berglund Construction. It is expected to be completed in 2018. Watch the below video from Berglund Construction to find out more.